Everybody loves robots! (Well, except for Sarah Connor.) They come in all shapes and sizes: from small to large; simple to complex. As hobbyists, we're often drawn to more complex robots, but sometimes a simple design is more fun. 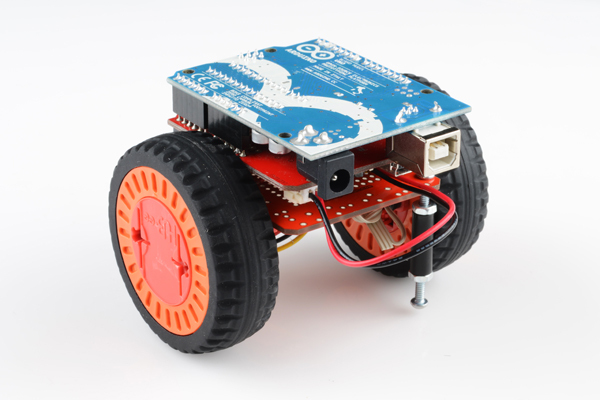 The HUB-ee Buggy robot is a simple two-wheel, object-avoiding robot based on the HUB-ee wheel system. HUB-ee wheels make it possible to build a wheeled robot chassis in a snap by combining the wheel, motor, and driver into a single package. Just bolt a pair of HUB-ee wheels onto a microcontroller, and you've basically made yourself a little robot. That's essentially what we're doing here. This is an awesome project for starting out with robotics, because it's easy to go from a pile of parts to a rolling robot which can easily be expanded with more sensors, wheels, or complex control code as you learn and progress. Here are some topics you'll need to be familiar with to make your Hub-ee Buggy.